Check out this tomato! Yesterday, my friend Janet Hiron, a fellow S.F. 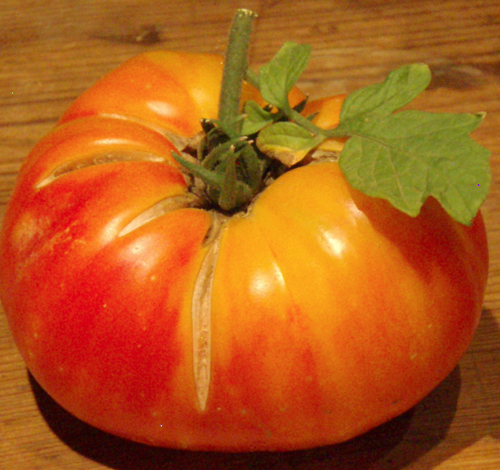 Master Gardener, gave me an huge tomato that she grew called ‘Virginia Sweet’. She only has maybe 8 of them on her plant (so I got 1/8th of her harvest-bless her). What a beauty and I can’t wait to eat it! It is a bicolor and should be marbled with red orange and yellow streaks inside. She said the flavor is unbelievable. This one is over 2 lbs. Thanks Janet! This entry was posted in general, GIANT TOMATOES, TOMATOES and tagged growing tomatoes, heirloom tomatoes, Virginia Sweet tomato.